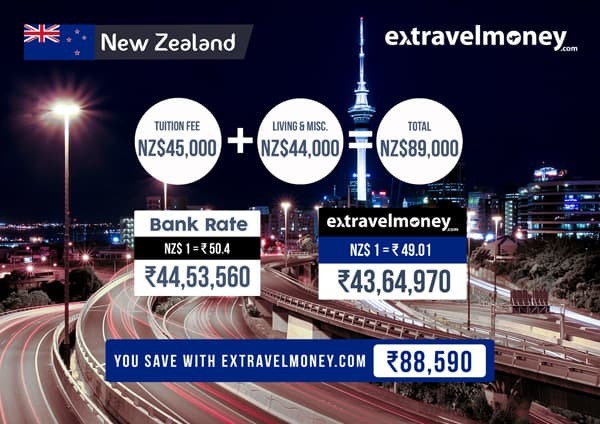 Have you ever wondered how much it would cost you to study in the top 10 most popular study abroad destinations providing the best education? 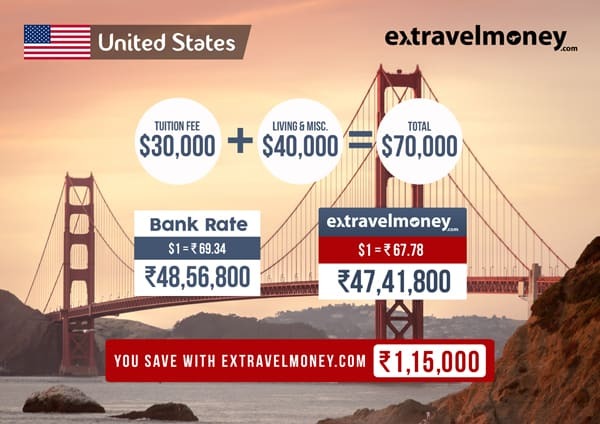 The countries are listed in the order of their popularity with The United States being the most popular and sought after destination by students from India. 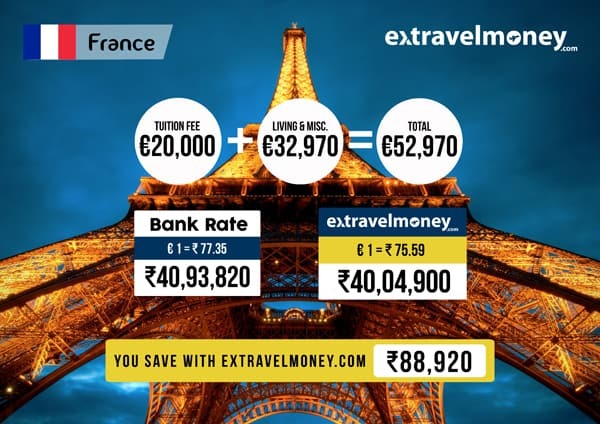 A methodic analysis by ExTravelMoney forex experts on living costs, tuition fee & other miscellaneous costs reveals the expense data for top 10 popular study abroad countries for Indian students. The figures are based with respect to Postgraduate Programmes for two Years and the average exchange rate prevailing in July 2016. 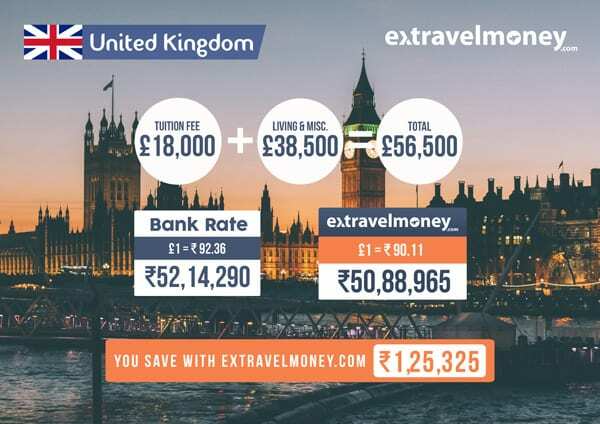 Here is a set of infographics that compare the Average cost of studying abroad when money is sent abroad through Banks and when sent abroad through ExTravelMoney. The United States is the country with the most number of international student intake every year. More than 1,30,000 Indian student went to the US alone last year for studying. 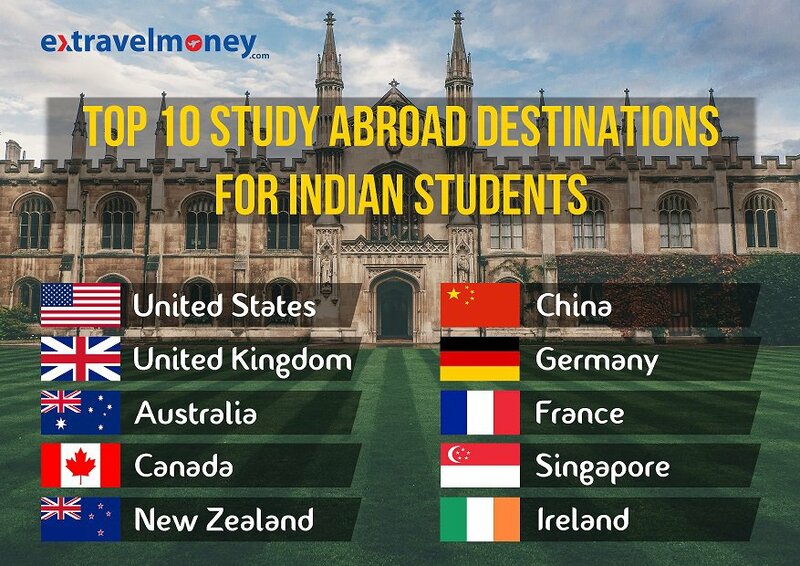 That is, more than 50% of Indian students heading abroad in total! Long idolized as the destination for those pursuing academic excellence and a good global exposure, it is the dream destination of most students planning on a study abroad programme. The United Kingdom has two of the world’s oldest continually operating educational institutions. The University of Oxford which was started in 12th Century AD and the University of Cambridge in 13th Century AD. These universities are even now amongst the most coveted and prestigious universities worldwide and people have come to associate the education in the UK for its quality and pure academic experience. 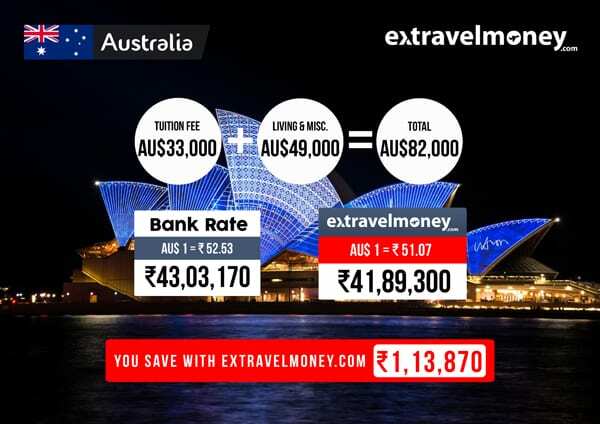 The third most preferred country by Indian students after the US and UK is Australia. It has a rich and vibrant student community with students from many different parts of the world. An interesting fact about Australia is that the seasons are in reverse there due to it being in the southern hemisphere. The winter months are from June to August! Every year, more than 1,80,000 international students from around the world choose Canada for studying. It’s a country that has been long popular as study abroad destination for Indian students and it’s not hard to see why. The top notch educational institutions, the beautiful landscapes, the warm and welcoming people all combine together to make it so popular. This island nation right next to Australia is on this list for all the right reasons. The robust education system there involves a strong research-intensive curriculum that imparts comprehensive subject knowledge. It’s a very safe country with friendly people, which is another reason in its favour. Students are flocking there to experience this academic culture and to also see the stunning vistas there that got featured in movies like “The Lord of The Rings”. Did you know? China is regularly one among the top three countries to file International Patent Applications right alongside the likes of The United States and Japan. 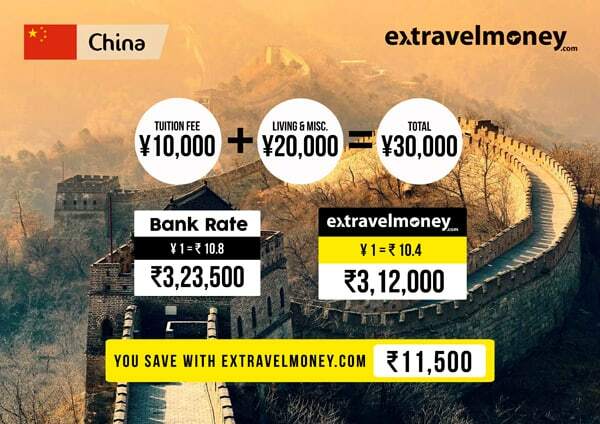 That itself speaks volumes about the research and innovation happening in China and add to this the fact that the cost of stay and quality education is comparable or even lesser than in India, then we can understand why so many Indian students are going there for their higher education. Medicine is the most popular field chosen by Indian students going to China, as its cost is just a fraction of the study cost in India and also due to the large availability of seats there. Germany is one of the world’s strongest economies and the business hub of Europe. For Indian students looking for a global career, Germany is a very attractive option. It’s a leading country in research, in the fields of Science & Technology and is one of the best countries for those wanting to pursue engineering and experience the legendary “German Engineering”. 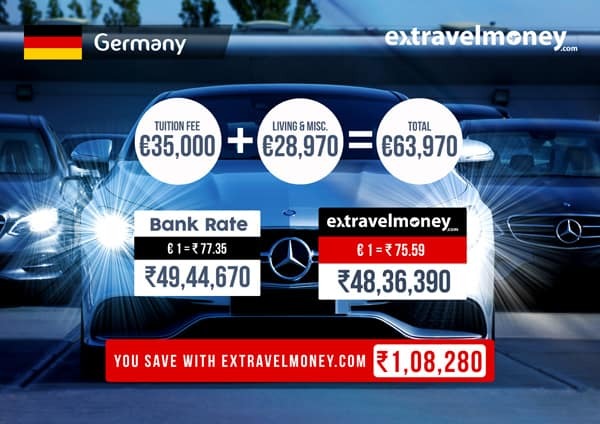 The salaries for graduates from German universities are one amongst the highest in the world and average around €40,000/year or around ₹ 30 lakhs/year. Also, undergraduate studies in Germany have been made free for both domestic and International students since the year 2014! France has a rich intellectual and artistic heritage and has produced some of the best artists, Mathematicians and scientists the world has ever seen. Universities in France are primarily research-driven and have a faculty of a high standard. Paris, the cultural and national capital of France is considered to be one of the safest cities for students. This Asian economic powerhouse is home to The National University Of Singapore and Nanyang Technological University which are the 12th and 13th ranked in the latest QS World Universities Rankings for Asian universities. The country is very strict when it comes to law enforcement and has zero tolerance for racism, drugs and is hence considered very safe for students. Ireland is not to be confused with Northern Ireland, which is still very much a part of the UK. Ireland is a magically beautiful country and offers a very good study programme which is at par with universities in the US and the UK and at a fraction of the cost to boot! With the increasing strictness of visa grants for Indian students in UK and US, Ireland is fast emerging as a good alternate location for studies abroad. 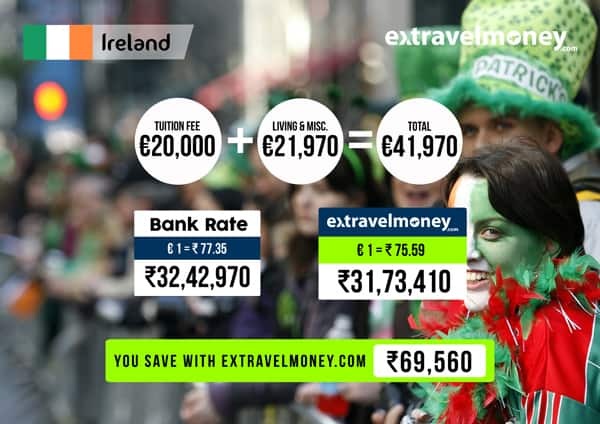 You can save a lot of money by choosing to study in Ireland. 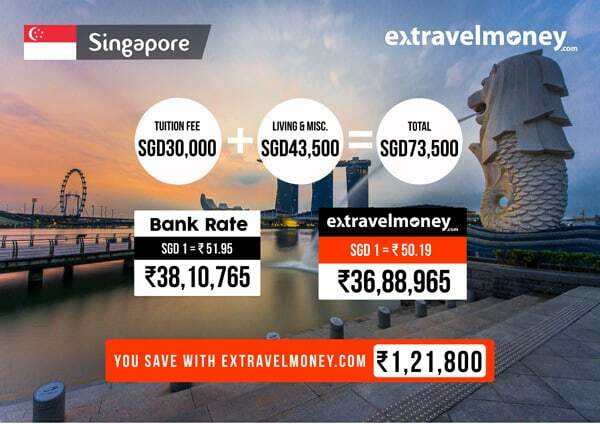 Use ExTravelMoney for your study abroad forex needs like paying tuition fees, maintenance money etc and save money on your education programme abroad! 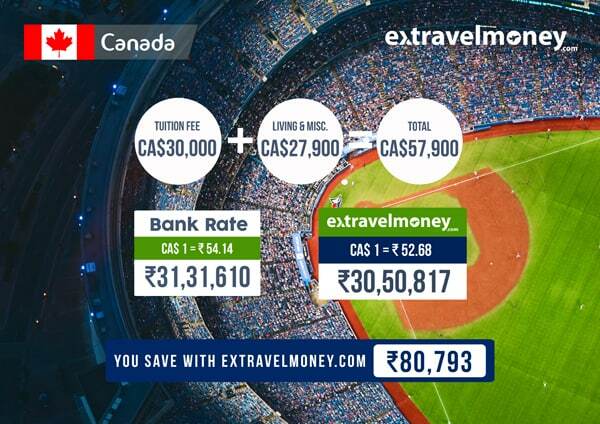 « 5 Smart Hacks For Saving Money On Study Abroad!